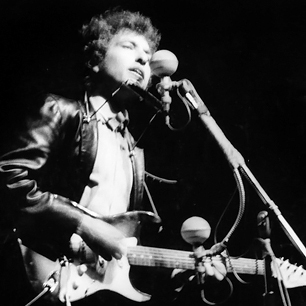 Fifty years ago today, Bob Dylan went electric at the Newport Folk Festival (much to the dismay of many of his fans).
" the sound of both booing and cheering can be heard a few bars into Dylan's first song, "Maggie's Farm", and continues throughout his second, "Like a Rolling Stone". Dylan and his band then performed "Phantom Engineer", an early version of "It Takes a Lot to Laugh, It Takes a Train to Cry". Dylan was said to have "electrified one half of his audience, and electrocuted the other".